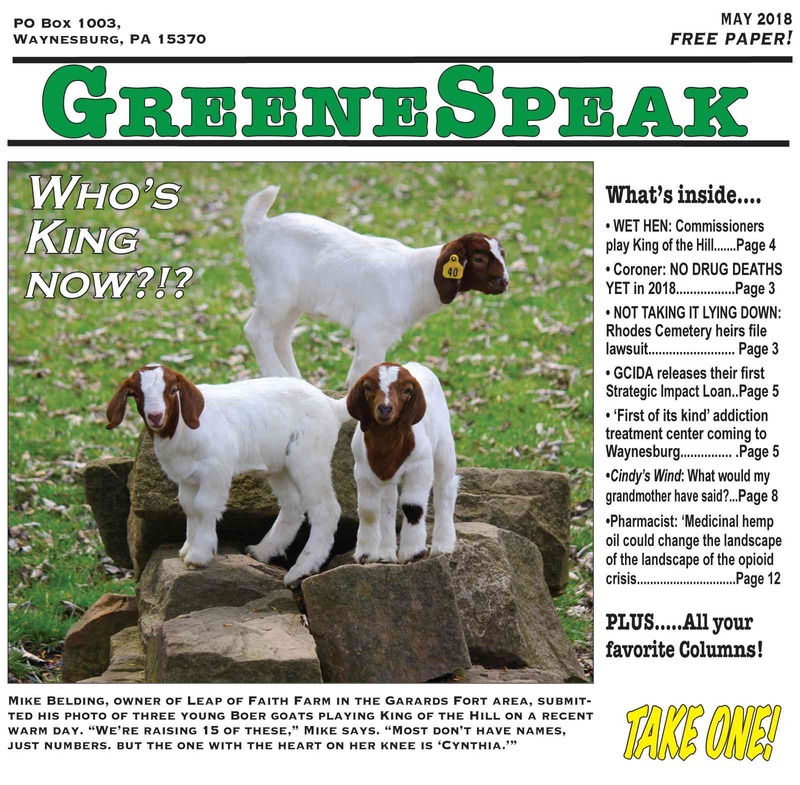 GreeneSpeak Publications, LLC, home of GreeneSpeak newspaper, published and edited by Cindy Bailey of Waynesburg, PA.
At GreeneSpeak, the Publisher has always been dedicated to providing local news and views free of charge to people in and near Greene County, PA. If you've been with us for the last 14+ years (the original GreeneSpeak website was launched way back in February 2004! ), you may know that we don't offer too many bells and whistles: just honest reporting, heartfelt writing by local authors, and as much news as we can afford to print. We don't have IT experts here; we move forward with technology as much as the time and pocketbook of one person can stretch (and still have some semblance of a life LOL. So we hope you will enjoy the archived complete back issues of GreeneSpeak and be patient with us as we add more. The things that matter won't change at GreeneSpeak, including our dedication to social justice, our support of worthy causes, and our brisk conservative political views, but mostly, what lies beneath it all: the hope that people can find in knowing God. The paper is free all over Greene County We encourage you to pick up an extra copy for a former Greene Countian who doesn't live here now, and mail it to them yourself. If you own a business and like the sound of what we do, contact Editor/Publisher Cindy Bailey at 724-344-7980 or cinswind1290@fairpoint.net. I can send you some sample papers. You can see our very reasonable ad rates right now if you click on the "Advertise With Us" page, above. Discounts are available for multiple ads. Our 15TH YEAR of publishing JUST Greene County, PA !! THE COMPLETE EDITION OF THEAPRIL 2019 GREENESPEAK is NOW posted@ CLICK BELOW THE FRONT PAGE. Recent Back Issues are below. Earlier editions are on the Back Issue Page. COVER STORY: SEVEN, YES 7, Exclusive Interviews with the County Commissioner Candidates Pg 4-10. The WET HEN wonders why anyone needing publicity would BALL OUT a fire-breathing Editor at the ONE remaining local, independent newspaper Page 2.
Who's on YOUR ballot? See all County and Municipal candidates running in the Greene County, PA Primary Election PAGE 3. Cindy's Wind is a confessional tale regarding, uhm RAISIN BREAD. Pg 13. Plus...Interesting stuff in,...Waynesburg Matters, Roots of Health, and Minding the Mind.